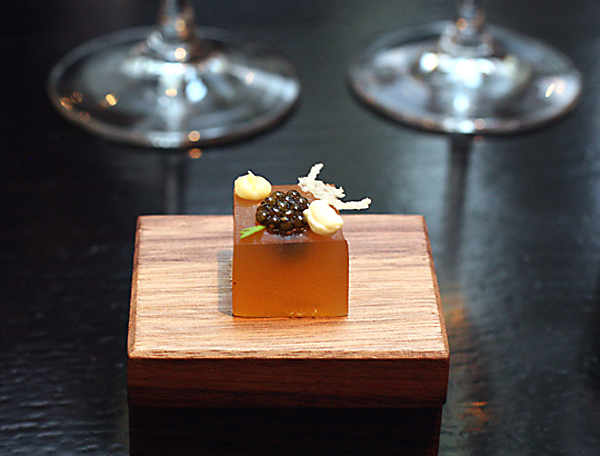 In the Bay Area, it’s Asian flavors that seem to be on everyone’s plate and palate these days. So much so that French cuisine — though not its classic techniques — seem to have fallen out of favor. 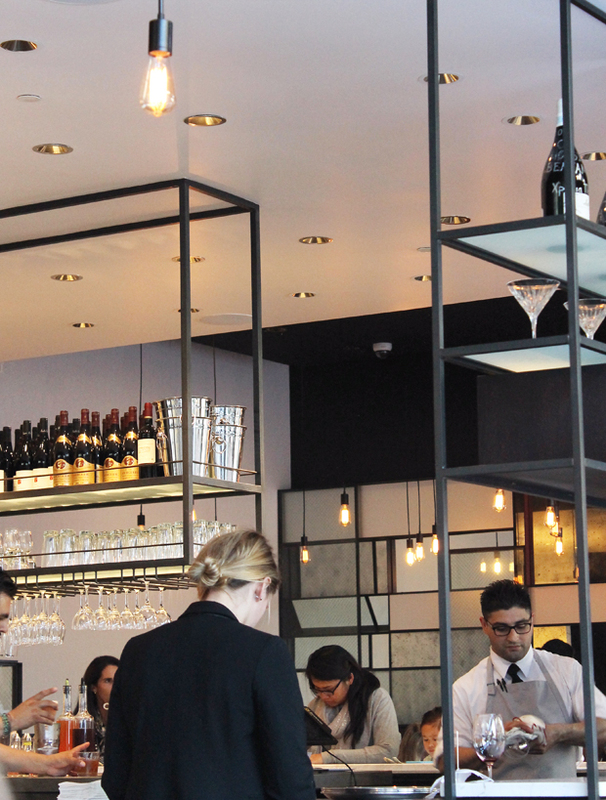 But leave it to Monsieur Benjamin, which opened last summer in San Francisco’s Hayes Valley, to remind us why French food — just like a sharp little Chanel suit — truly never goes out of style. Korean-born Corey Lee may imbue his Michelin three-starred Benu with breathless Asian flair, but with his second, more casual restaurant, Monsieur Benjamin, he stays the course of timeless French dishes yet gives them a touch of modernity. 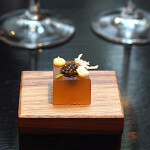 His right-hand man is Chef Jason Berthold, late of RN74 in San Francisco, who worked with Lee when both were at the French Laundry. 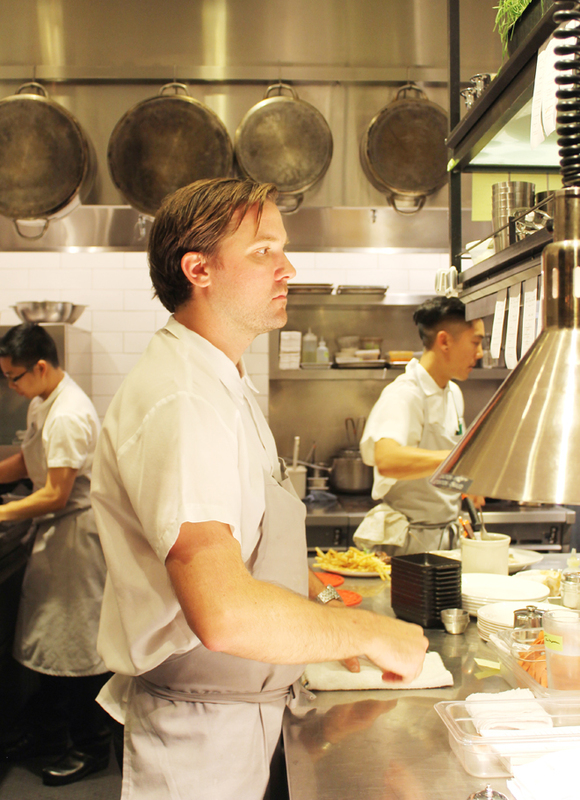 Chef Jason Berthold deep in concentration in the kitchen. 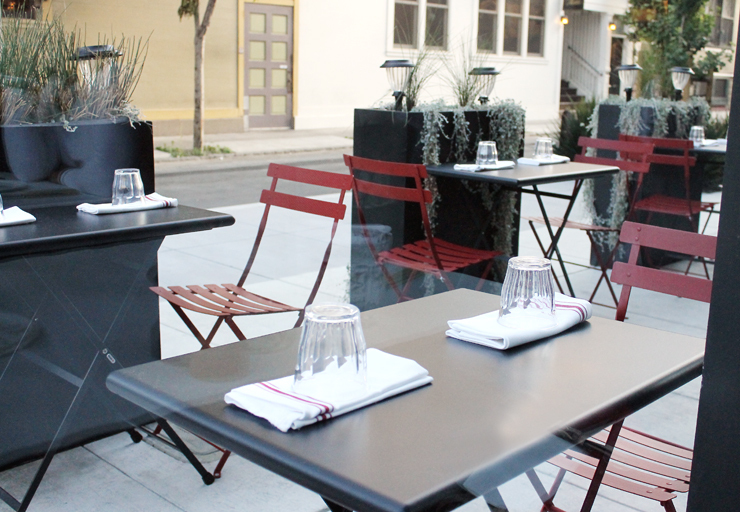 The bistro doesn’t try to recreate the look of one in Paris. Instead, it very much fits in with its San Francisco surroundings, incorporating a lot of stainless steel, clean lines and striking black walls. 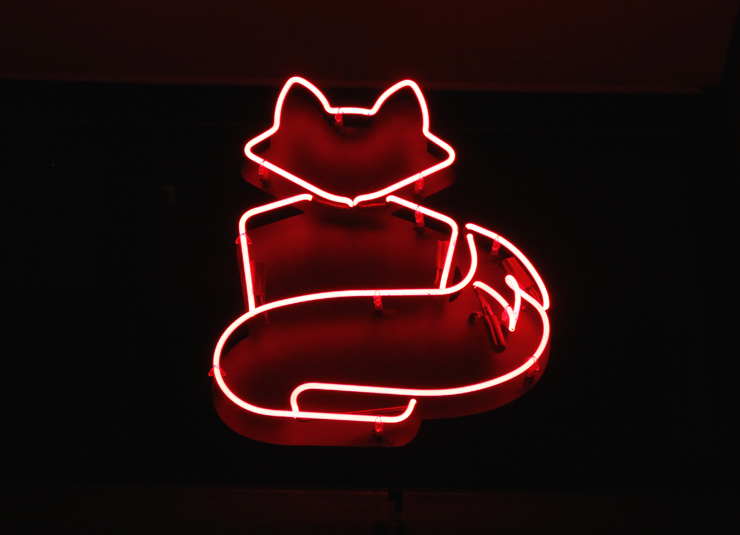 You’ll spot the entrance easily by the neon red fox image above it, the mascot of the restaurant. You’ll see the fox again and again on the plates, too, which are so eye-catching that people have tried to pilfer them, the manager said. The mascot above the entrance. My friend Jo-Lynne and I paid our tab, but Berthold sent out gratis a few extra dishes he wanted us to try. 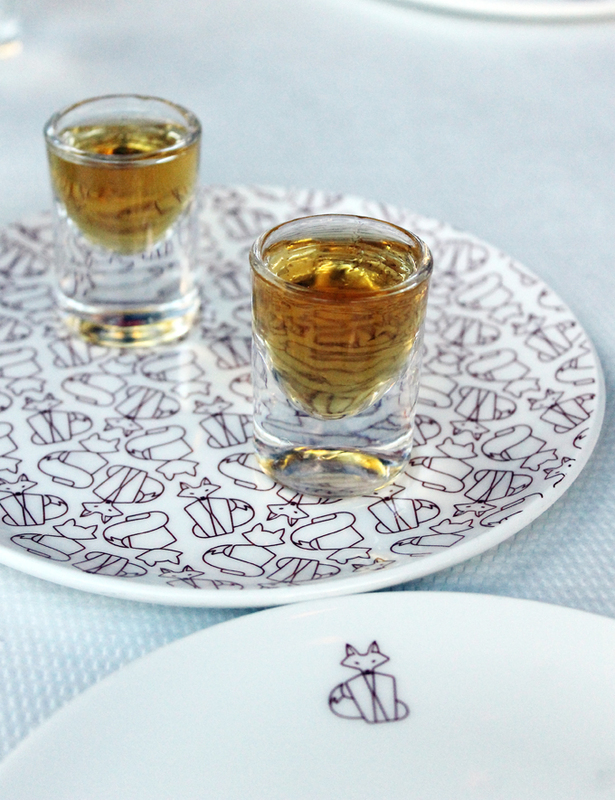 Shot glasses of apple cidre were presented as a amuse — providing the perfect way to study the menu, which is quite lextensive. A gift from the chef to start the evening. 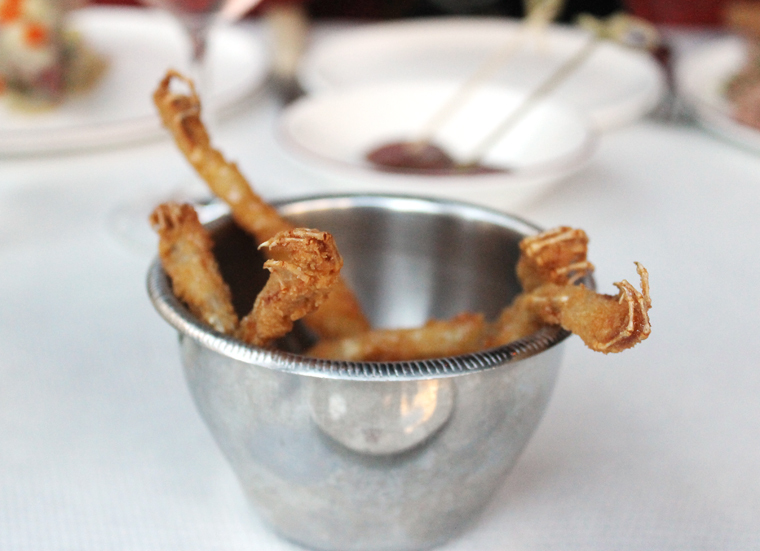 Of course, we had to order the famed fried frog legs ($12.50), which have become a signature. You don’t see frog legs on menus very often these days. And when you do, few are prepared as memorable as these. They are fried poker-straight with all their teeny appendages at attention in an elegant silver cup. Mild tasting, juicy and crunchy, they get a small puddle of a garlicky, lemony sweet-sour sauce at the bottom of the cup. They will make any cocktail or glass of wine taste all that much better. Beef tongue on rye bread. Steak tartare with those unique yolks. Close your eyes and take a taste of the Beef Tongue Dijonnaise ($14.50) and you’ll imagine yourself eating corned beef, but a much more refined version. The neat slab rests on rustic rye bread and gets a flourish of diced carrots for color and texture. 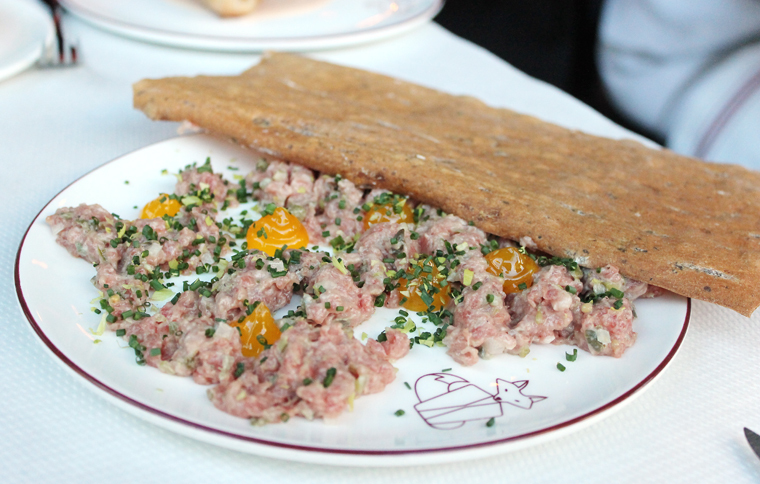 Steak Tartare ($18.50) comes to the table hidden under big slabs of crisp lavash. Nudge that aside to find the beef so finely chopped that it ends up with a wonderfully creamy texture. The accompanying raw egg is not the norm. Instead the bright orange-yellow yolk has been cooked sous vide, then squirted out here and there on the plate with a pastry bag. The texture is like a pastry gel. 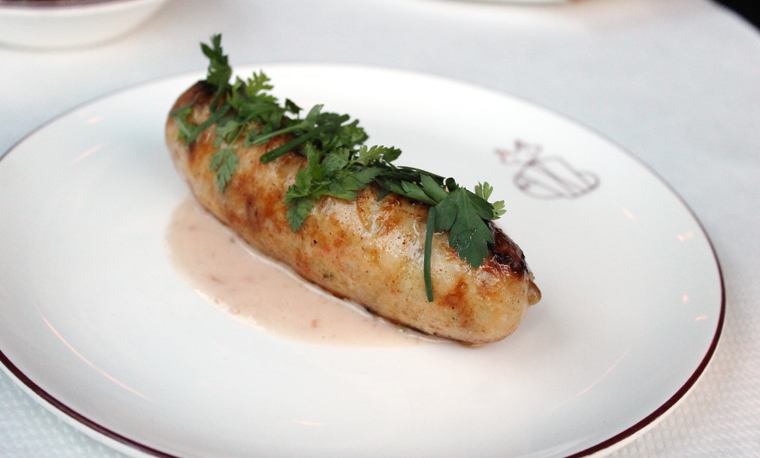 The Seafood Sausage ($17.50) may look a little lonely on the plate by itself, but when it’s this supple and juicy, who needs anything else with it, especially when it rests in a puddle of rosé butter sauce. Gulf Flounder Gratinee ($28) brings a delicate fillet rolled around a mousse of spinach and fish, that’s finished in a luxurious shrimp cream sauce. Arctic char crowned with toasted almonds. 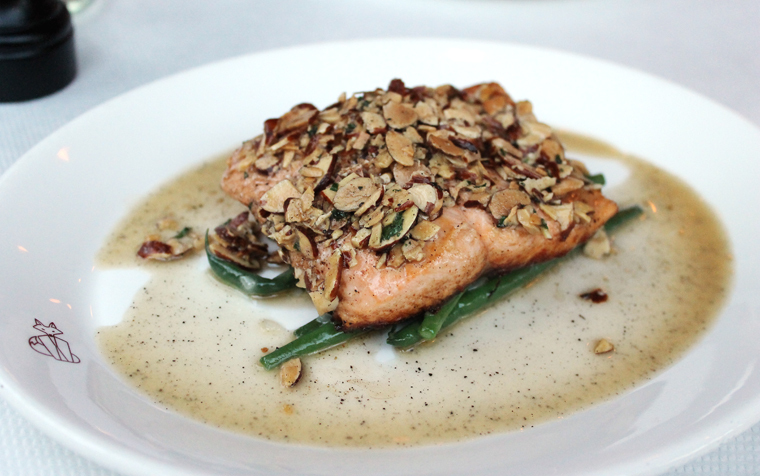 Arctic Char Amandine ($28.50) is indeed covered in a profusion of toasted almonds. The crunchy topping adds a nice contrast to the rich, soft fish underneath that was cooked to a nice pink inside. A classic beurre noisette napped it. Yes, more butter. But you can go to the gym tomorrow, so don’t give it a second thought. Remember, this is classic French, after all. 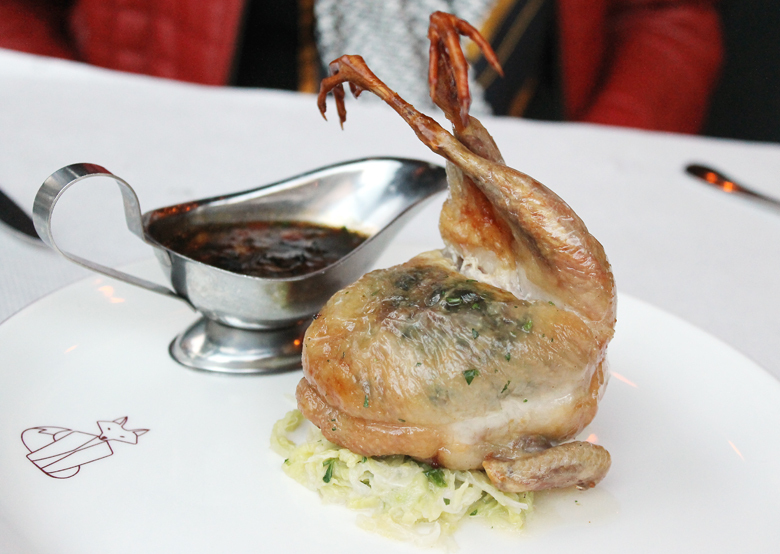 The Quail a la Chasseur ($32) is stunning. It arrives on the plate with its legs like a ballerina at rest, pointing upward and languidly enfolding one another. It’s beyond juicy. 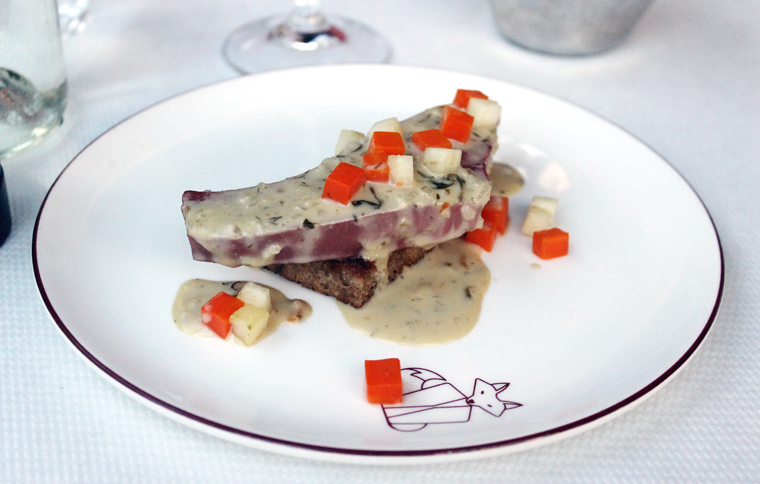 A veal sauce adds a real savoriness and richness. There’s also the most decadent cabbage — cooked until meltingly soft with plenty of butter. When it comes to dessert, you can’t go wrong. 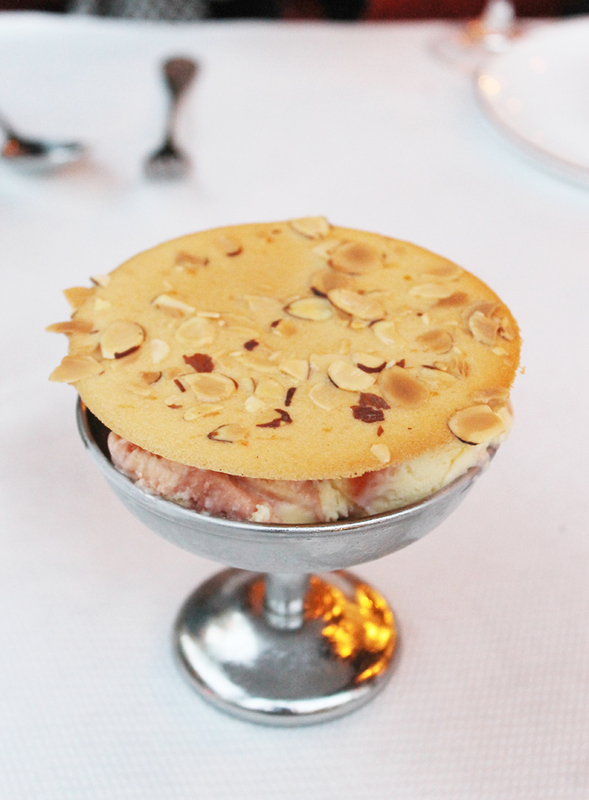 The Marzipan and Cherry Ice Cream with Almond Tuille ($8) is the stuff of dreams with plenty of cherries throughout that have a gourmet maraschino-like flavor. The Gateau Marjolaine ($12.50) has received a lot of attention. And rightly so. 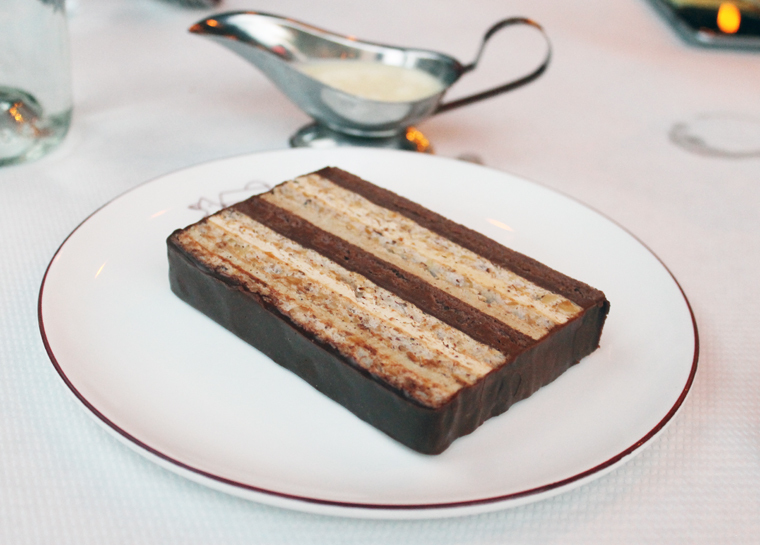 It’s layers upon layers of hazelnut, praline and chocolate. Alongside is creme anglaise to pour at your wish. It reminded me of my times noshing on lovely little cakes at Alice Medrich’s old Cocolat bakery in San Francisco. The gateau has an air of elegance yet tastes ever so wicked. 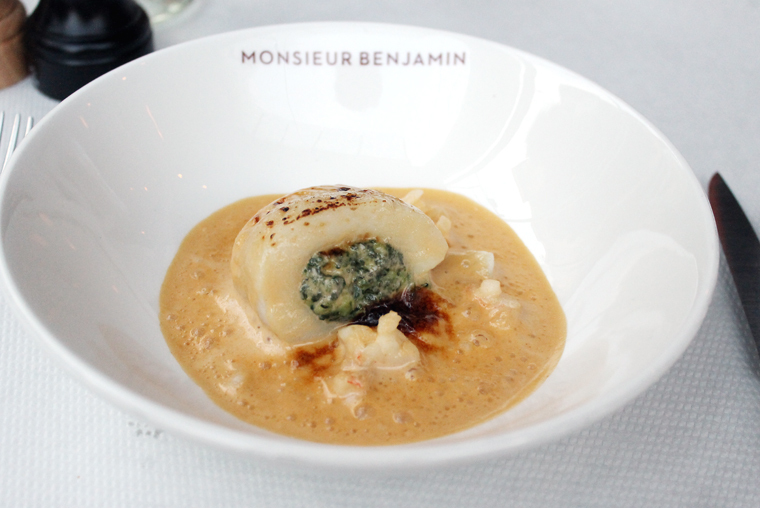 If you haven’t eaten French food in a long while, dining at Monsieur Benjamin will remind you just how special it is — and why it continues to be relevant and satisfying. That fox logo is very cool. Whole restaurant sounds very cool! French food never goes out of style, although I haven’t been seeing too much of it around lately. This sounds like a terrific place — thanks for the review. I’m glad you were able to try the gateau! Definitely one of my favorite and I think a signature of the restaurant (more so than the fried frog legs since I probably wouldn’t order them since they’re deep fried!). I think Lee has really defined the term “modern bistro” with this restaurant. Actually, Cocolat was in Berkeley – such a different place than San Francisco.